There is a paucity of information on the conditions under which multiple climate-smart practices are adopted and on the synergies among such practices in increasing household resilience by improving agricultural income. 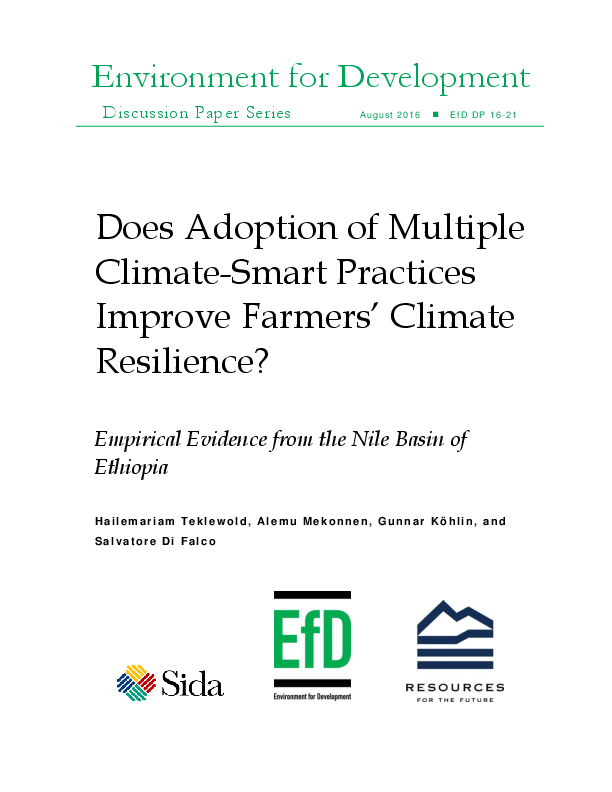 This study analyzes how heat, rainfall, and rainfall variability affect farmers’ choices of a portfolio of potential climate-smart practices – agricultural water management, improved crop seeds and fertilizer – and the impact of these practices on farm income in the Nile Basin of Ethiopia. We apply a multinomial endogenous switching regression approach by modeling combinations of practices and net farm income for each combination as depending on household and farm characteristics and on a set of climatic variables based on geo-referenced historical precipitation and temperature data. A primary result of this study is that farmers are less likely to adopt fertilizer (either alone or in combination with improved varieties) in areas of higher rainfall variability. However, even when there is high rainfall variability, farmers are more likely to adopt these two yield-increasing inputs when they choose to (and are able to) include the third part of the portfolio: agricultural water management. Net farm income responds positively to agricultural water management, improved crop variety and fertilizer when they are adopted in isolation as well as in combination. But this effect is greater when these practices are combined. Simulation results suggest that a warming temperature and decreased precipitation in future decades will make it less likely that farmers will adopt practices in isolation but more likely that they will adopt a combination of practices. Hence, a package approach rather than a piecemeal approach is needed to maximize the synergies implicit in various climate-smart practices.